A smart, punny cocktail bar in Tooting. Brick & Liquor, a swish addition to Tooting’s ever-expanding portfolio of nice neighbourhood venues, takes cocktail making very seriously. The menu is navigated via a graph, its axes based on how adventurous you’re feeling and how tipsy you fancy getting. All cocktails are classics with a twist (and a pun). A Pisco Sour becomes a Pisco Fever with the addition of basil; a Manhattan embellished with crème de bananes is a Banhattan. Purists might balk, but they were really good – a little too good in fact (the former was particularly light and zesty). There’s also a good little wine selection. But while the liquor’s in order, this place falls at the food. It was out of a third of the menu, so what we did order was more out of desperation than desire. Lamb skewers were chewy, the marinade undetectable; cauliflower couscous was mushy and depressing, the kind of thing you’d eat out of Tupperware at your desk. ‘Maybe they ran out of all of the good things,’ we wondered. Entirely possible, but if they can whip the food up to the same standard as the drinks, this would be a brilliantly well-rounded local. 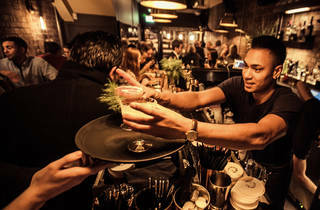 A bustling neighbourhood bar serving unique cocktails creations alongside an exciting and innovative menu of 'Social Eats', purpose made for sharing. 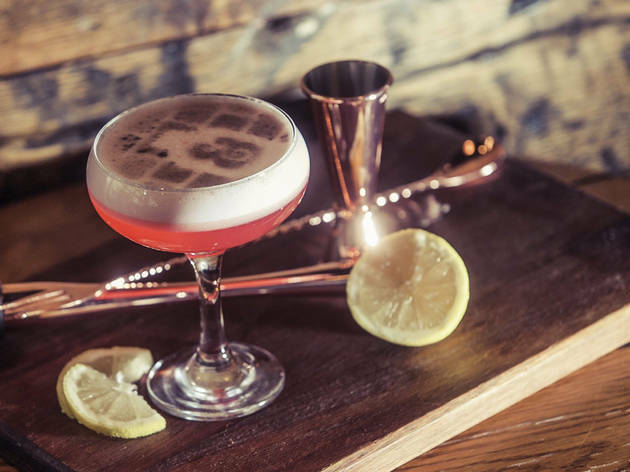 Brick & Liquor is the new place to be in Tooting – its concept is to be like a neighbourhood bar where customers chat to the staff (and each other if you wish!) and find out more about the unique cocktails on offer. It reminded me of a couple of bars I had visited in New York – small, homely and cosy. The cocktails are inventive with tongue in cheek pun like names. I loved the cocktail graph in the menu where you can choose your cocktail based on “refreshing”, “strong”, “adventurous” and “comforting” – nice to be given a little bit of guidance. My favourite cocktails were the Mexican Wave and Clover Club! Most of them are reasonably priced at £8.50. We had a few nibbles to accompany the cocktails with the focus on sharing plates (my kind of place!) My friends had the vegetarian platter, which came with grilled halloumi and tomato skewers, olives and the infamous scotch egg served with homemade focaccia, homous & smoked paprika mayonnaise. They were absolutely delighted with it and commented how full they were after! As a meat eater, I went for the teriyaki steak skewers, pork belly bites and chorizo and mozarella arancini (my favourite!). Small plates are £6 or large £10. The staff were extremely friendly & helpful, and they were very knowledgeable and passionate about Brick & Liquor. I can see Brick & Liquor becoming popular quickly, and with only around 40 covers, book a table before they go! They also hold a wine tasting on Wednesdays and a cocktail club on Thursdays. Such a great addition to Tooting's never ending gentrification! Brick & Liquor is affordable and tasty bar with great service thrown into the mix! We went along for Wine Wednesdays which is a great tasting offer of 3 small (125ml) glasses of wine for £12. Each wine was served with a bit of chat about where it came from and what made it taste so good. This was short and sweet, informative without dragging on for ages (let's be honest, we really just want to drink the wine!). To go with the wine we ordered a carnivore sharing platter which was good but not great. Everything was tasty enough but a day on I don't really recall any individual items which is never a great sign. We did also have some Padron Peppers which were grilled to perfection! Next time will perhaps just stick to those and wine....balanced diet and all that! Will definitely be back soon to test out some of B&L's infamous cocktails too! I am completely in love with this bar and so pleased that it is right on my door step. The atmosphere is incredible and its great to throw on some heels on a Friday and Saturday night in tooting. The cocktails are imaginative and taste great and the skinny Prosecco is awesome. Brick & Liquor does everything to a great standard. The staff are very friendly and knowledgeable, the venue is perfect for date night or girls night and the food is yummy (I have had pretty much everything on the menu). I have recommended this place to all my friends and looking forward to my next chilli and chill already. Although Brick & Liquor is not a huge venue, this adds to the brilliant atmosphere there. The staff were extremely friendly & helpful, and they were very knowledgeable about all the dishes on their menu, and also their unique list of cocktails. This can be very useful especially if you are undecided what to order. We ordered a selection of dishes to share, and they were all delicious . My wife's intention is now to work her way through their cocktail menu, especially as Brick & Liquor's cocktails are different from the normal cocktails you tend to find at all other venues. We definitely recommend this great place, go and try it yourself you won't be disappointed.. I love Brick and Liquor! It is, by far, my favourite local bar and I have visited with friends regularly since they opened. The food, cocktails and ambiance have always been on point. The carnivore platter was perfect for sharing with the girls over some cocktails, other personal favourites are the lamb, chorizo arancini balls sharing plates and the focaccia bread which is EPIC! The cocktails are a must have, my firm favourite is chilli and chill but always enjoy tasting others from the menu, including even making some of my own in their first cocktail masterclass! The staff are a delight and the venue itself, it's true that the best things come in small packages. New Year's Eve at B&L was a particular highlight, the best way to ring in the new year! When I venture down to Tooting Broadway I usually end up camped out in a pub, however after watching some re-run's of SATC on Saturday night we decided to glam up and head down to this lovely little cocktail bar in order to recreate the NY cocktail scene. The first thing you notice is the size which is pretty small. We were lucky enough to loiter at the entrance for a few mins while a bunch of guys left, but if you're not willing to wait around then you could be waiting a while. Once we did get a stool seat we did get offered a table but were happy enough were we were. It is waiter service and the staff were very pleasant. Our waiter forgot our order so it took a bit of nudging for our wine to arrive. Cocktails are inventive and fun, with the gin ones being particularly tasty. I would definitely return for cocktails and really want to try the food out next time, Definitely somewhere to check out for pre-drinks when it's too cold to go to the market! I've managed to have two visits to Tooting's latest cocktail bar in the month it's been opened. The staff are so good looking it feels like you are in a movie and they are super friendly. The vibe in the place is exciting yet relaxed. The 3 or 4 cocktails I've drunk personally and the ones of others I've tasted have been fabulous. The chilli one is my favourite. The food we had was also delicious and almost perfectly matched for snacking alongside cocktails. Slightly bigger than tapas but in the main finger food. The only dish that didn't strike the right note was a cod one that needed a fork and was difficult to share. The only thing that stops this being a five for me is it is pretty small - so it will always be a gamble whether you can get in and they have also decided on dark speakeasy lighting - which is just a bit too dark for my tastes. But all in all a great addition to the my fabulous Tooting array and I can't wait to go again and again - until I have tried ALL (except the gin ones) cocktails! I still long for the a cocktail bar that does a platter of taster sized cocktails so one can try them all! 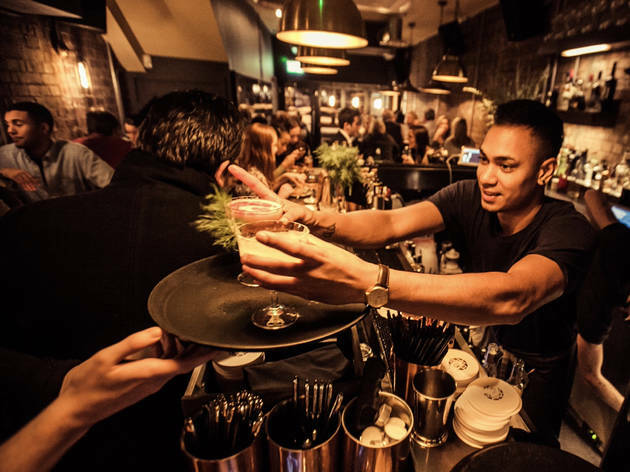 Great selection of original cocktails, relaxed speakeasy vibe and sophisticated crowd. A good place to go for a nightcap or nightout! It's a shame the official TimeOut reviewers didn't get to experience the same level of quality I've always experienced at this place. Been to Brick & Liquor for the first time based on a recommendation from a friend and only had drinks that time: their version of espresso martini (The Daily Grind) was really delicious and strong. The Caramel Salted Old Fashioned was also excellent. My second and third time there, I've also had food: the lamb skewers were juicy and tender, arancini hot and delicious, the padron peppers grilled to perfection. It could do with a bit more salt perhaps, but that's a personal preference. The music also never disappoints, especially the last time I went there, the bar was almost full when the lights came on (at 2am or 3am - can't remember exactly) and they had to ask us to leave. Everyone in there would have stayed for at least another hour or two had they not asked us to leave - such was the quality of the atmosphere! All in all this place does have delicious food, good drinks and even better tunes - feel free to check it out if you don't believe me - you won't be disappointed! We stumbled upon this bar about a month ago when out for girly drinks, when walking past we noticed that it looked busy so were intrigued. We were instantly greeted by one of the staff who showed us to our table, we ended up ordering a bottle of wine (as default), when chatting to the waitress later in the night she recommended the cocktails, I ended up with a chilli and chill – wow! Since we’ve been back for food, focaccia and dips, ribs and pork belly bites are personal favourites! We’ve also been back on a Saturday for the DJ and skinny Prosecco! It’s always got a great atmosphere and the staff are always happy to see you! Huge fan! Brick & Liquor is a fantastic venue, with great staff, delicious food and brilliant cocktails. The atmosphere is first class, and is definitely a hidden gem. We ordered a selection of dishes to share and they were all delicious, without exception. The great discovery of the month! The new Shoreditch is Tooting! Tooting Broadway is literally transforming into a trendy area with the opening of new bars and restaurants. Among those new bars, you will find the amazing Brick and Liquor! B&L is a not just one cocktail bar among others; the menu is not long like the arm, and you can taste the work behind each cocktail. I opted for the Eton Mess, right in the middle between Adventurous and Comforting, and rather refreshing than strong. It was delicious. The raspberry purée in the cocktail was full of flavor, and the bitterness was going perfectly with the meringue the cocktail expert burned on the top of my cocktail! Tooting is pretty far from where I live but it definitely worth the trip! Don’t forget to book! And if you follow them on Instagram, you may get an invitation for free food! I can only base my review on the drinks as I have not eaten here yet- but I can say the drinks are lovely. 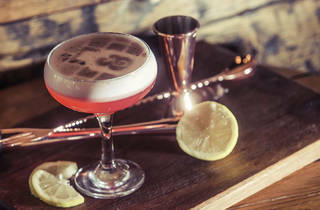 If you are after a few cocktails but something more classy and different than a WooWoo go to Brick and Liquor. I loved that the menu is smaller compared to other cocktail bars so you don't get too overwhelmed by the choice, and there is a handy index in the front breaking all they do down into categories like strong, sweet etc. I went for the summer special, Ninety 9, and it was like stepping into a boozy ice cream truck. Not too sweet so you could still taste the alcohol but it definitely tasted like the best Mr. Whippy I have ever had. Love the stripped back feeling in the place, not to flashy and really friendly staff. Will be going back for more. This place has some delicious and creative cocktails that are expertly prepared and beautifully presented. I am not a biggest cocktail drinker, but I really enjoyed The Daily Grind and Clover Club and the guide at the front of their menu was perfect in helping me pick them! The owner was a real gem, chatting to everyone, but be careful as you can rack up a hefty bar tab by the end of the evening. The food, as expected was very creative with rum & coke ribs and vegetarian scotch eggs on the menu, however, we tried a platter and two meat dishes and unfortunately, they didn’t rock my world. The rum & coke glaze was very thick and slightly overpowering, the pork belly was rather greasy and the vegetarian scotch egg on the veggie platter was a little salty and I sadly didn’t love it. I would go for the drinks and the brick walls. All the other reviews I've read have touched on the cocktails (tasty classic twists) and the food (fun little sharing plates) but for me what sets this place apart is the atmosphere. It's as if the cosy neighborhood pub got all dressed up in its best finery for a classy night out. It's elegant, it's chic BUT it's warm and inviting at the same time. It's like the local boozer of the 21st century - replacing darts and pints with daiquiris and pisco sours. I can see this place being very popular with first daters, girlfriends catching up and weekend birthday celebrations! My only complaint? I wish it was twice the size!